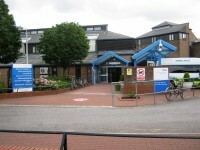 The Hospital Main Entrance is on Bancroft Road, which is off the A11 Mile End Road. Driving from the east, it is not possible to turn right into Bancroft Road. 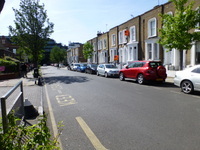 Continue further along Mile End Road and turn right into Globe Road (just before Stepney Green Underground Station) then right into Alderney Road to join Bancroft Road. There are 12 Blue Badge bays and a small number of standard pay and display bays for patient and visitor parking at the hospital. There is high demand for spaces, which are often full. There are a limited number of Pay and Display bays on Bancroft Road. Other areas are reserved for resident permit holders. Patients and visitors are advised to use public transport or be dropped off at the hospital where possible. 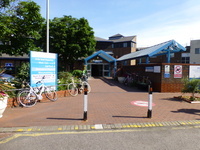 The nearest bus stops are on Mile End Road, about 250m from the Hospital Main Entrance. Buses 25 and 205 run along this route. All London buses have an automatic ramp and a designated space for a wheelchair user. An Oyster card, contactless bank card, pre-paid travel card or travel pass is required to travel on London buses. 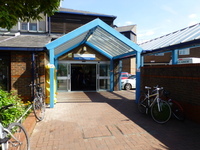 The nearest station is Limehouse, which is about 1 mile (20 minutes walk) from the hospital. 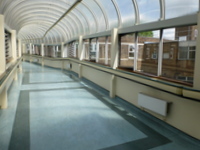 There is step-free access from platform to street from the C2C rail services. Staff are available to assist with ramps from train to platform. Limehouse is also served by Docklands Light Railway (DLR) services, which are step-free from train to street. Bow Church DLR station is on Mile End Road and connects with the 25 and 205 bus services towards the hospital. The nearest Underground station is Stepney Green on the District and Hammersmith & City Lines. There is no step-free access at this station. There are about 40 steps between the platform and the street. DisabledGo access guide to Limehouse Rail and DLR station. DisabledGo access guide to Bow Church DLR station. There are free phones in the hospital to contact a minicab service. 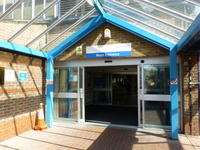 The Patient Advice and Liaison Service (PALS) is located at the nearby Royal London Hospital to serve both hospitals. 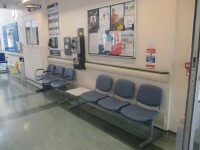 There is public telephone and a minicab and information free phone in the main entrance waiting area. 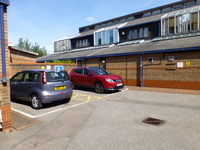 The car park is located to the left and right of the main entrance, off Bancroft Road. There is/are 12 designated Blue Badge parking bay(s) within the hospital car park. 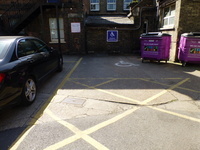 The dimensions of the designated Blue Badge parking bay(s) surveyed are 380cm x 480cm (12ft 6in x 15ft 9in). The drop-off point is located at the blue canopy, to the right of the main entrance. 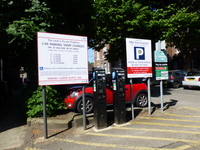 Payment machines are located in the centre of the car park, at the start of the patient and visitor parking area, and outside the main entrance. 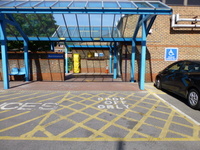 The nearest designated Blue Badge parking bay is approximately 8m (8yd 2ft) from the Hospital Main Entrance. There are 5 Blue Badge bays to the left of the main entrance, 4 to the right, 1 near the Rheumatology Entrance, 1 at the far side of the the main patient and visitor parking area, and 1 just before the exit barrier. 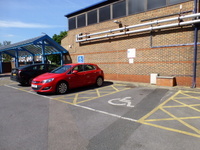 There are only around 20 standard bays for patients and visitors in this car park. Payment can be made by phone using the RingGo App. The barrier at the entrance to the car park is held open. There is a barrier which raises automatically at the exit. 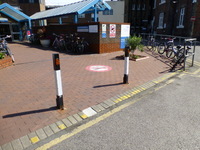 On-street parking bays are located on Bancroft Road, to the north of the hospital main entrance. 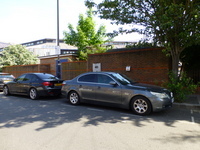 These parking bays operate on a pay-by-phone system Monday to Friday, 08:30 - 17:30. The maximum stay is 4 hours. 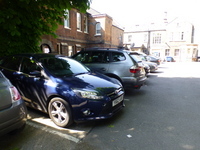 Other on-street parking is restricted to resident permit holders only Monday to Friday 08:30 - 17:30. This information is for the entrance located ahead from the gateway on Bancroft Road. There are bollards outside this entrance. The minimum width between the bollards/wall is 183cm. The main entrance is open 05:00 - 23:00. There is an intercom at the gate on Bancroft Road to contact security outside of these hours. 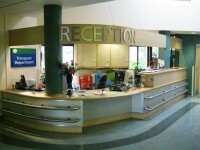 You are on Opening Times (Main Reception). Skip to the next section. Please see the guides to each of the clinics and services for their opening times. 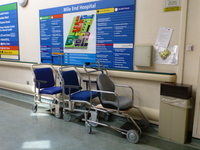 You are on Waiting Room / Area (Main Reception). Skip to the next section. 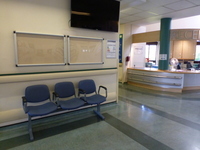 The waiting room / area is approximately 2m from the main entrance. 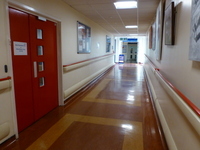 There is a slight slope, with handrails on both sides, for access to the Red, Blue and Yellow Zones from the ground floor corridor leading from the Hospital Main Entrance. This slope is about 3m long and is shown in photographs 1 and 2. There is a slight slope, with handrails on both sides, for access to the Restaurant and Burdett House (Blue Zone) at the end of the main corridor in the Red Zone. This slope is shown in photographs 3 and 4. There is a slight slope, with handrails on both sides, for access to the first floor of the Red and Yellow Zones from the Green Zone corridor. This slope is shown in photographs 5 and 6. It has a level resting place halfway up. 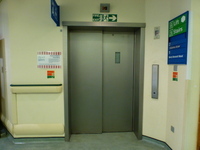 The slope can be avoided by using lifts C and D in the Red Zone or Lift G in the Yellow Zone to go directly to the upper floors in those areas. 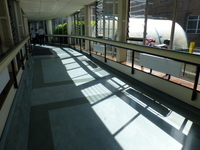 Handrails are provided in corridors. Seating is not provided in corridors. The wayfinding signage includes some pictograms. Maps are provided at key intersections. 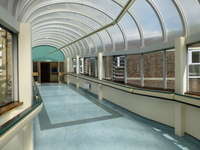 The hospital main building is divided into four colour zones. 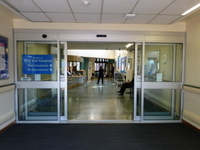 The Hospital Main Entrance is in Green Zone. From here corridors lead to the Red, Yellow and Blue Zones. 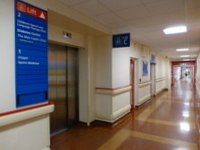 The zone colours are shown on sign boards, coloured handrails along the corridors and painted on the walls above the doorways in the main corridors. In some areas, doors are also colour coded. You are on Other Floors (Green Zone). Skip to the next section. The stairs are located off the main corridor, next to Green Zone Lift B. 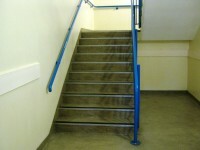 The stairs are approximately 25m from the main entrance. 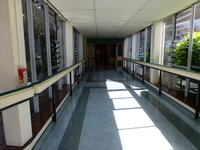 There are also stairs in Green Zone, off the corridor to the left before the main reception. You are on Lift (Lift A - Green Zone). Skip to the next section. 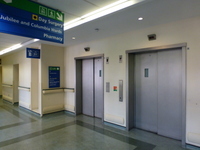 The lift is located at the end of the corridor, to the left just before the main reception desk. 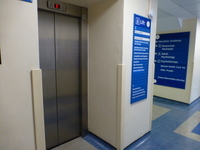 The lift is approximately 50m (54yd 2ft) from the main entrance. 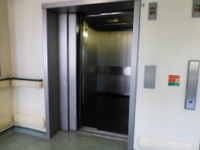 The dimensions of the lift are 150cm x 240cm (4ft 11in x 7ft 10in). You are on Lift (Lift B - Green Zone). Skip to the next section. 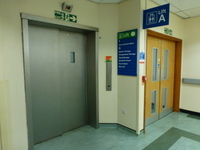 The lift is located in the main corridor, past reception. There are 2 identical lifts in this location. You are on Lift (Lifts C and D - Red Zone). Skip to the next section. 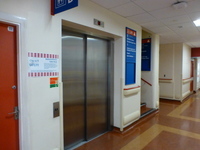 The lift is located in the Red Zone main corridor. The lift is approximately 75m (82yd 1in) from the main entrance. Lift D is similar and is 30m further along the main corridor. You are on Lift (Lift G - Blue Zone). Skip to the next section. 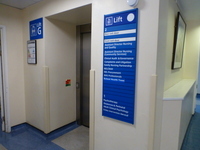 The lift is located off the main corridor, close to the Burdett House Courtyard Entrance. The lift is approximately 7m (7yd 1ft) from the Burdett House Courtyard Entrance. You are on Accessible Toilet (Ground Floor - Yellow Zone). Skip to the next section. 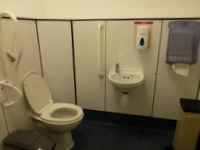 This accessible toilet is located off the ground floor corridor, in the Yellow Zone. 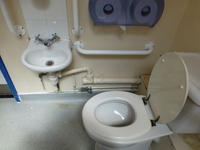 This accessible toilet is approximately 125m (136yd 2ft) from the main entrance. This is a female toilet. 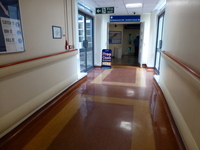 The toilets are off lobbies which open off the main corridor. There is a heavy inwards opening door (95cm wide) to enter the lobby. 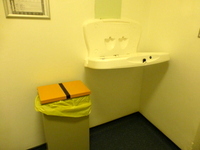 In the female toilet described, the baby change unit and a clinical waste bin are in this lobby. In the male toilet there is a urinal and washbasin in the lobby. 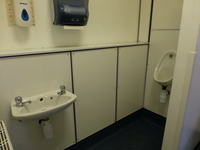 The male toilet has the transfer space to the right (photographs 3 and 4). You are on Accessible Toilet (Ground Floor - Blue Zone - Restaurant). Skip to the next section. This accessible toilet is located off the main corridor in Blue Zone, opposite the entrance to the restaurant. This accessible toilet is approximately 4m (4yd 1ft) from the restaurant. 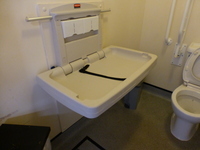 The dimensions of the accessible toilet are 140cm x 250cm (4ft 7in x 8ft 2in). You are on Accessible Toilet (Ground Floor - Blue Zone - Burdett House). Skip to the next section. 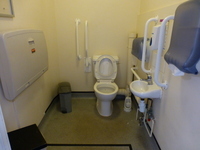 This accessible toilet is located just past lift G on the Blue Zone corridor, or to the right as you enter the Burdett House Courtyard Entrance. 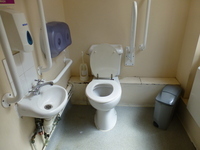 This accessible toilet is approximately 6m (6yd 1ft) from the Burdett House Courtyard Entrance. 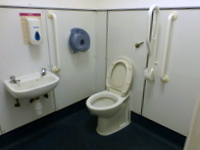 The dimensions of the accessible toilet are 141cm x 200cm (4ft 8in x 6ft 7in). 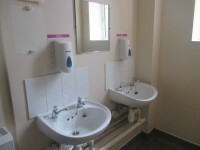 The female and male toilet facilities that were surveyed are located to the right as you enter the Burdett House internal entrance. The female and male toilets are approximately 4m (4yd 1ft) from the Burdett House internal entrance.